Emily Eisenhart (MA, Social Sciences) is on the Advisory Council of RA and is the Director of the Center for Addiction Recovery in the Jiann-Ping Hsu College of Public Health at Georgia Southern University in Statesboro, Georgia. Eisenhart is the assistant director of the Study Abroad Ghana trip organized within the Jiann-Ping Hsu College of Public Health and has brought Georgia Southern students in long-term recovery to Ghana in the summer of 2012 and 2013. The aim of the GSU study abroad students in long-term recovery is to exchange experience, strength, and hope with Ghanaians and gain insight and experience working within the international public health sector. 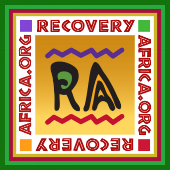 The students who have returned from Ghana have been forever changed because of their experiences, and they often have the resources to increase awareness of the lack of resources of those attempting recovery from alcoholism and addiction in Africa. Mrs. Eisenhart is interested in building connections with treatment and halfway facilities in Ghana to track recovery outcomes and learn how to increase sustainable resources that have a measure of demonstrated success. After her first trip to Ghana, Emily fell in love forever with the country, people, and culture and never wants to stop trying to help people in Ghana and all over Africa to find ways into recovery.